I have curly hair which I flat iron all the time. I don't have times for curls because its a lot to maintain. However when I do want to wear it curly, I use a diffuser. However I gave up on that years ago because they are so big and hard to store. But now that's all an issue of the past! 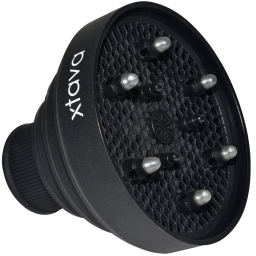 Xtava came out with a collapsible hair diffuser that can compact itself so it easy to store away in a drawer. This diffuser is made out of silicone so its soft and easy to compact. It opens and closes with no problem and fits on just about any blow dyer. It works with ease and gives you hair big beautiful bouncy curls without blowing them all over the place which at times results in knots. I love this diffuser and for the price, totally recommend it!! FTC: Product was sent for review. I was not paid for this review and all opinions are my own.